The last four days have been pretty productive. First up the Baby Bear Quilt top has been completed. The red fabric in the pinwheels will also be used for the binding. 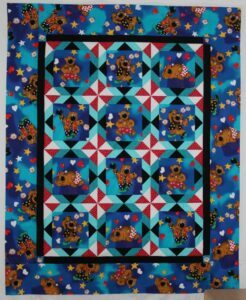 While not one of my favorites, this bear quilt is bright & cheerful and will make a great baby quilt. I also cut out triangles for the neutral HST in Wild Child. 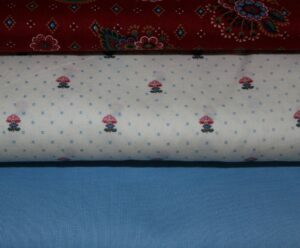 The neutral is one fabric and goes great with the blue background fabric and the red border print. The good thing is that I need to make 40 neutral background blocks and that gives me time to think about the inner border fabric color. 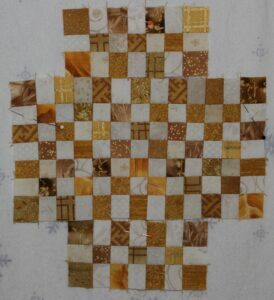 The three gold checkerboard rectangles for the Lincoln quilt were also sewn together. Next up the four triangle units. I spent so much time second guessing the color for this block, but went ahead with my original plan of gold. Hopefully I can get the triangle units finished this week and start in on the LeMoyne stars for the cornerstones. It is exciting to finally be seeing the finish line in the race to complete this quilt top. You HAVE had a productive few days. I really love the bear quilt.